Happy Skin Kitchen – Page 24 – The quest for beautiful skin starts on your plate. Since we had such a gorgeous weather here in the UK in the past few weeks I have really been enjoying making raw treats instead of baked goodies. I tend to normally use a but base but this time I wanted to experiment with what I think is a very underrated seed which is sesame. Sesame seed are an excellent source of copper, a very good source of manganese, and a good source of calcium, phosphorus, magnesium, iron, zinc, molybdenum, vitamin B1, selenium, and fibre. Sounds like a lot of good stuff packed into such a small little thing, right? Especially if you are on a vegan or plantbased diet I would definitely recommend to try to incorporate this powerhouse seeds more into your daily meals more. 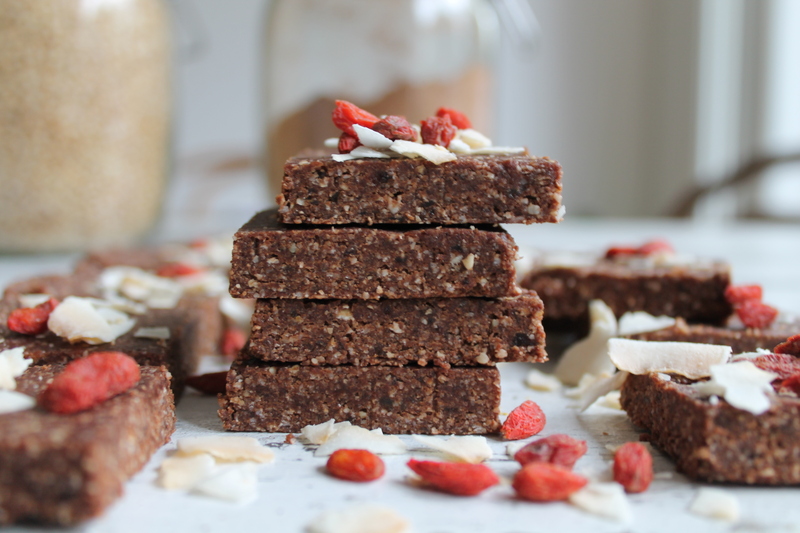 These bars are obviously a great way to experiment with sesame seeds, I love the combination of flavour with sweet dried apricots and the tangy notes of the maca powder. I love having one these bars before or after a work out as they give me a little boost of energy without make me feel too full or sluggish afterwards. Place the sesame seeds into a food processor and blitz for few moments, until the seeds start to break down but not completely dissolve into flour. Add all the remaining ingredients and blitz for a minute. You should have a quite sticky dough, if you feel is too dry add a bit more sweetener. Remove the mixture from the food processor and place it into a brownies size baking tin covered with parchment paper. Press the mixture down with your hands until it’s evenly spread across the tin. Place it in the fridge for at least 1 hour to firm up. Remove the tin from the fridge and cut into slices. Store the squares into an airtight container in the fridge for up to 2 weeks. These must be the best sweets I have ever made! They are so incredibly fudgy, chocolatey and wonderfully decadent without being sickly sweet. The buckwheat groats also add a really nice crunch and the dates give them a subtle caramel flavour. 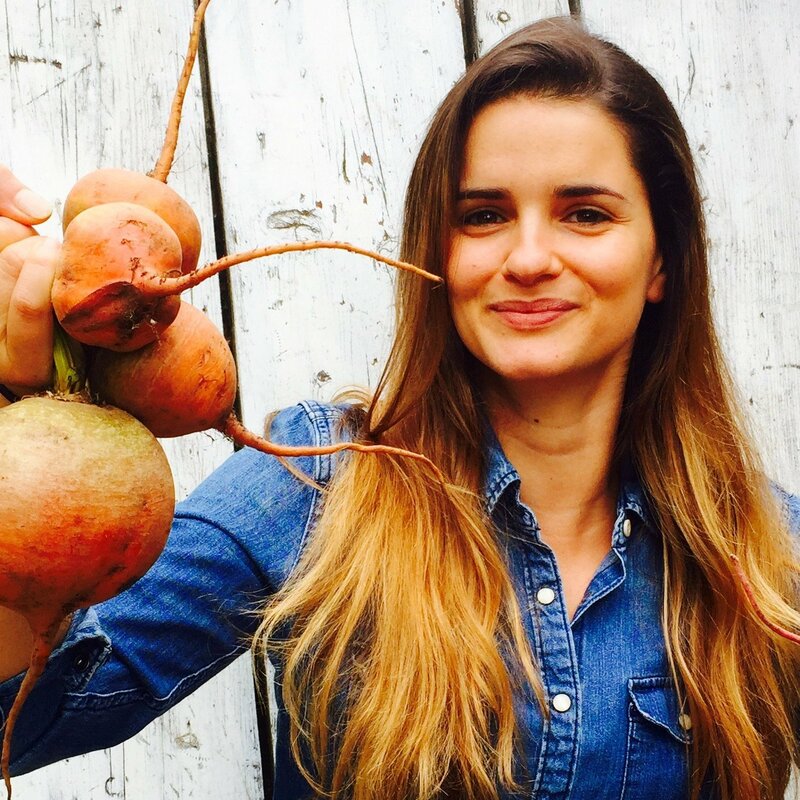 Apart from being so delicious and satisfying they are also a powerhouse of goodness. Buckwheat ( not to be confused with normal wheat) aside from being naturally gluten free is also packed with minerals like manganese, copper and magnesium and it’s an excellent source of fibre. To keep your skin healthy glowing I have used ground almonds, rich in vitamin E which helps maintain the collagen level in your skin and pumpkin seeds which are a great source of zinc, proven to help healing acne and keep skin spot free. 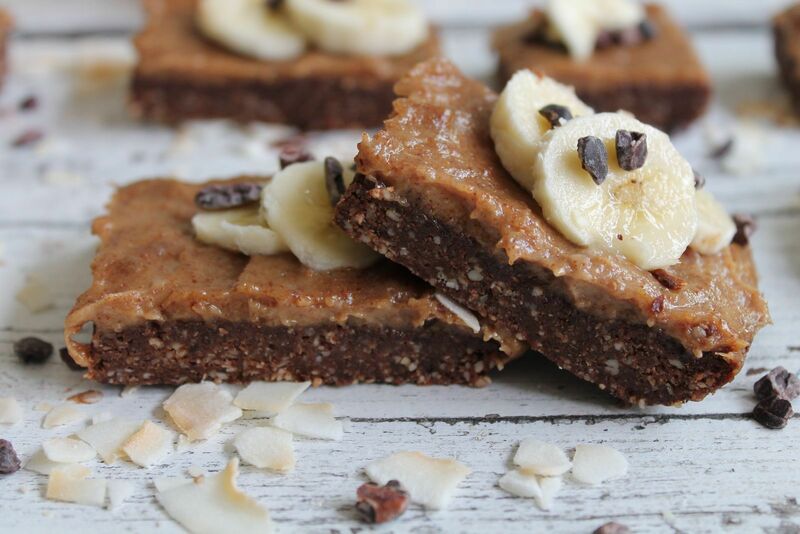 These bars are ideal for a sweet snack on the go as they are totally portable, I love having one after a work out (they are also high in protein) or when the 4 pm slump hits. They are also a definite crowd pleaser, I have made them few times for office birthdays and most importantly for the gorgeous ladies of Star in a Bra and every time they have proven to be a total winner! Spread the buckwheat grouts into a baking tray and roast them in the oven for about 20 minutes. After 10 minutes shake them around so they all get evenly toasted. Take them out when they start to turn golden brown. Leave them on one side. In a food processor place the pumpkin seeds and blitz until they are fully ground. Add the ground almond and raw cacao powder and blitz for few seconds. Add the pitted dates, the melted coconut oil and the cinnamon and blitz again until you have a sticky and smooth dough. Transfer the mixture into a bowl and add the toasted buckwheat and the raisin. Combine all the ingredients together. The dough will be quite sticky so I personally find easier to use my hand to mix everything together. Cover a baking tin with some parchment paper and spread the mixture evenly. Sprinkle with pumpkin seeds and goji berries and press them gently onto the dough with your fingers. Place the tin in the fridge for at least 2 hours. Remove from the fridge and cut into slices and enjoy! Store them in air tight container in the fridge for up to 2 weeks. These slices are simply a mouthful of heaven! I have made last Sunday and by Monday night they were all gone, I just couldn’t stop eating them. Thy are so moreish, decadent and deeply satisfying. I would swap a doughnut for one of these any days. 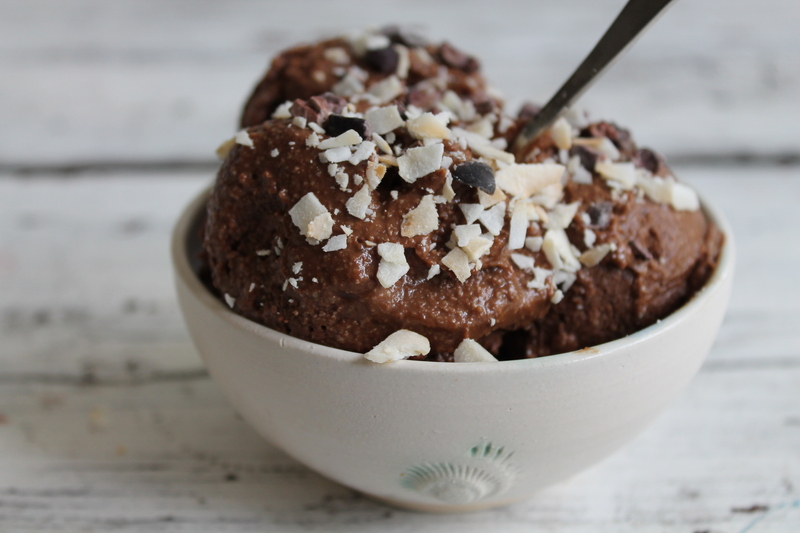 Chocolate, banana and almond butter are just 3 of my favourite things in the entire world so I knew they would have worked as a dream together. In a food processor place the oats, coconut and almonds. Blitz for less than 1 minute until you have a coarse flour. Add the pitted dates, the coconut oil and the raw cacao powder. Blitz again until a sticky dough starts to form. Remove the mixture and place it into a baking tin covered with parchment paper. With your hands spread the base evenly across the tin. I find it easier to use a glass jar as a “mini rolling pin”. Place the tin the fridge. To make the caramel layer peel the banana and place it in a food processor together with the almond butter and the dates. Blitz for a couple of minutes. You should have a sticky, silky cream. Don’t worry if you still have few bit of dates, it will still taste delicious! With a spatula spread the caramel on top of your base and place in the freezer for a couple of hours. Just before slice it into square and place few slices of banana on top and sprinkle with the cacao nibs and coconut chips. Store them in an air tight container in the fridge for 5-6 days. 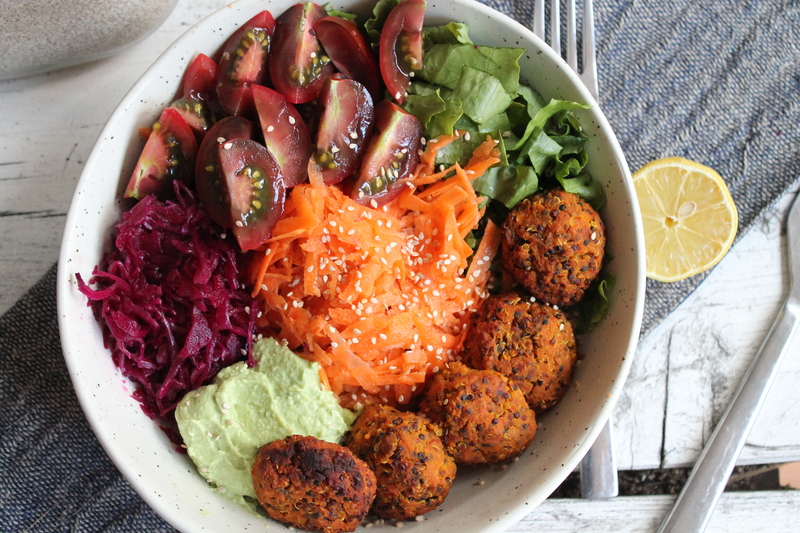 These little falafel have been my latest lunch obsession, they are so just so delicious and filling! I love making a big batch on Sunday and take them with me in my lunch box throughout the week. I just add a bit of salad, some chopped veggies, some hummus and my lunch is sorted! Start by peeling the sweet potatoes. Chopped them into pieces and steam them for 25 minutes. Once the potatoes are half way preheat the oven at 200 degrees Celsius. Once the potatoes are soft and a knife can go through transfer them to a food processor. Add the drained chickpeas, sundried tomatoes,lemon juice, all the spices and the garlic. Blitz everything together for a minute or so until you have a smooth paste. Transfer the mixture into a bowl. Fold in the cooked quinoa. With your hands take about 1 tablespoon of mixture and roll it into balls (I find it easier if my hands are a bit wet), the process is a bit messy I am not going to lie but the final results is totally worth it! Place the balls onto a baking tray covered with parchment paper. Bake in the oven for 30 minutes. Half away through flip them over so they cook evenly on both sides. Once they are cooked leave them on one side for few minutes, otherwise straight out of the oven they tend to crumble. Store them in airtight container in the fridge for up to 5-7 days. This salad is probably one of my favourite way of eating raw kale which I am going to be honest is not the most immediately friendly veg to be eaten raw, especially if you are a kale beginner! The key to eat raw kale is to chop it extremely finely (the smaller pieces the better) and to massage it for few minutes with a bit of lemon juice and salt. In this way the leaves soften and wilt so it’s also much easier to digest. To balance the bitterness of the kale I like to add chopped apples, grapes and goji berries, apart from adding so much antioxidants and vitamins their flavours and texture just works perfectly together. Finally the tahini dressing just brings everything together, it’s super creamy and decadent and make the kale even softer and juicer. This salad is also perfect to make in advance as it won’t go soggy, even after few days in the fridge it will still be crunchy. I like to make a generous portion on Sunday and then bring it into work with some some sweet potatoes wedges or some veggie burgers. Place it in a bowl and add the juice of ½ lemon, apple cider vinegar and a pinch of salt. With your hands start to massage the leaves, continue this process for a couple of minutes, you should start to see the leaves wilting. Leave it on one side. Simply whisk all the ingredients apart from the water in a bowl. At last add the water gradually until you reach the desired consistency. Ideally you want the dressing to be creamy but not too thick. Chopped the apple in bite size pieces and cut the grape in half. Remove the candied pecans from the oven and leave them onto one side. 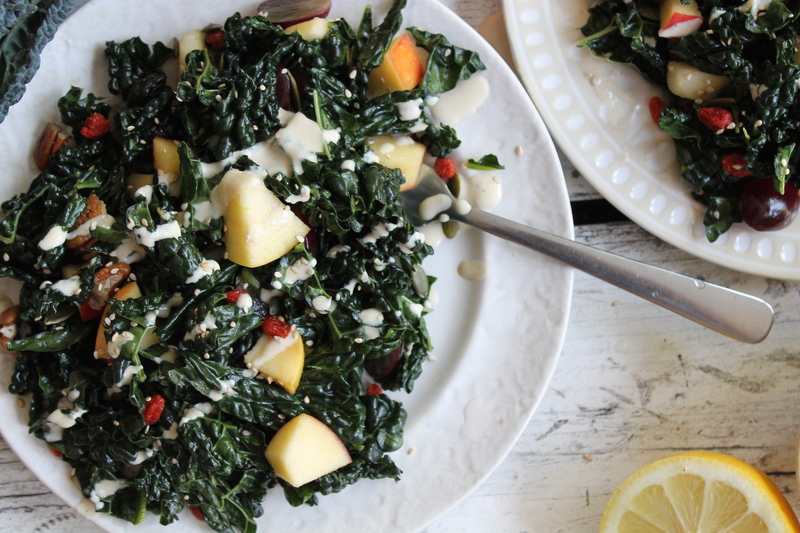 To assemble the salad simply add the apple pieces, the grape halves, goji berries to the bowl where you massaged the cavolo nero and mix everything together. When serving sprinkle the candied pecans on top and drizzle with the tahini dressing. I love playing around with raw sweets, they are so easy to make and they are almost always fail proof! They are also so quick to make as they obviously require no baking. 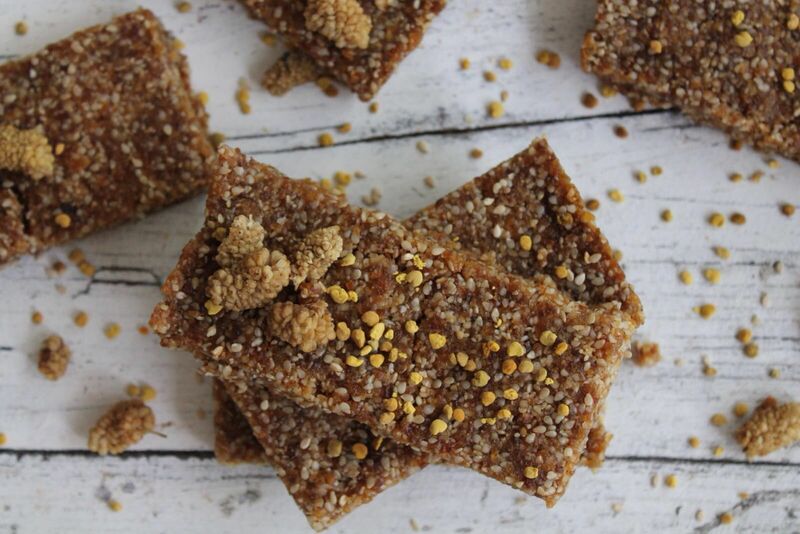 Medjol dates is almost always the base for this kind of treats, as they are sticky and naturally sweet so they are perfect to bind the ingredients together and they don’t require any added sweetener. If you are allergic to nuts you can totally substitute the ground almond either with more oats or with more shredded coconut (yes, is not a nut!). 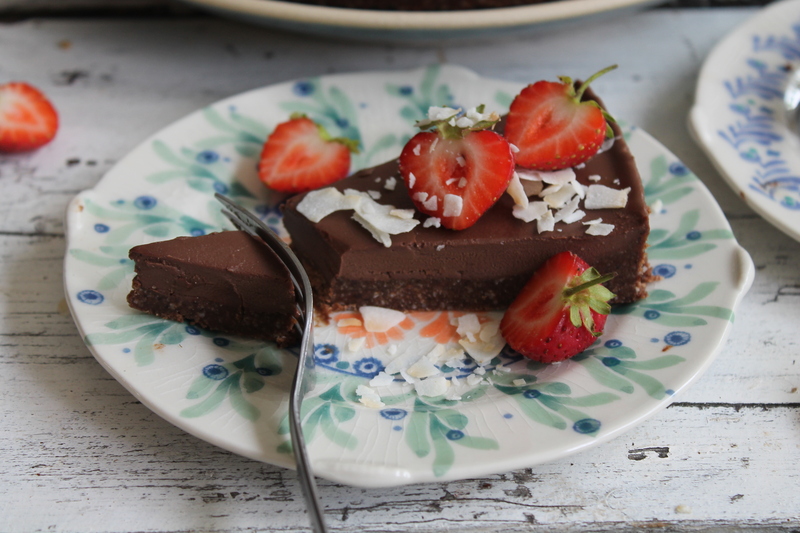 Raw cacao for me is the always the perfect match in terms of flavour, it literally transform them into fudgy, gooey and decadent bites of heaven! This recipe couldn’t be simpler! Place all the ingredients apart from the dates into a food processor and blitz for a minute until everything become the consistency of a coarse flour. Add the pitted dates and blitz again until a sticky ball starts to form. Remove the mixture from the food processor and with your hands press it down into a tin layered with baking paper. Spread the mixture evenly, I like to use a rolling pin as I find it helps to make the process easier. Place the tin in the fridge and leave it to set for about 1 hour. Remove it from the fridge and slice it in bars of the size you prefer. 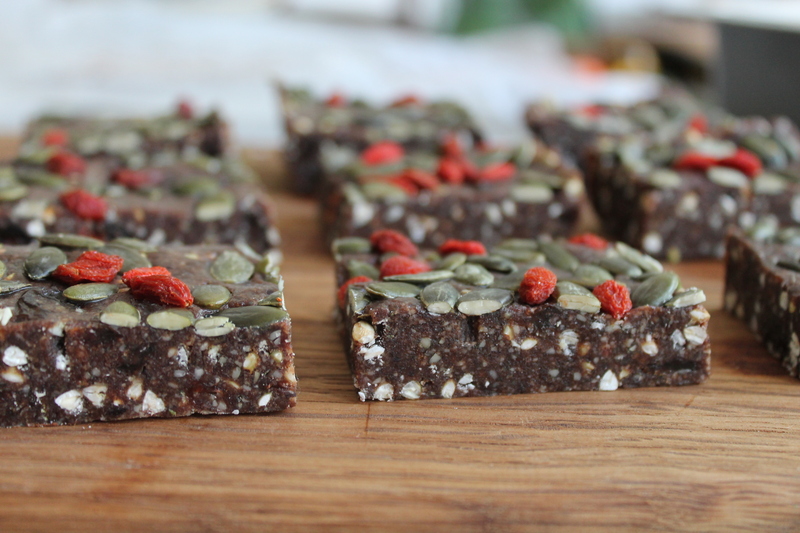 Sprinkle them with the coconut chips and goji berries and enjoy! My new summer obsession has officially began, parfaits! 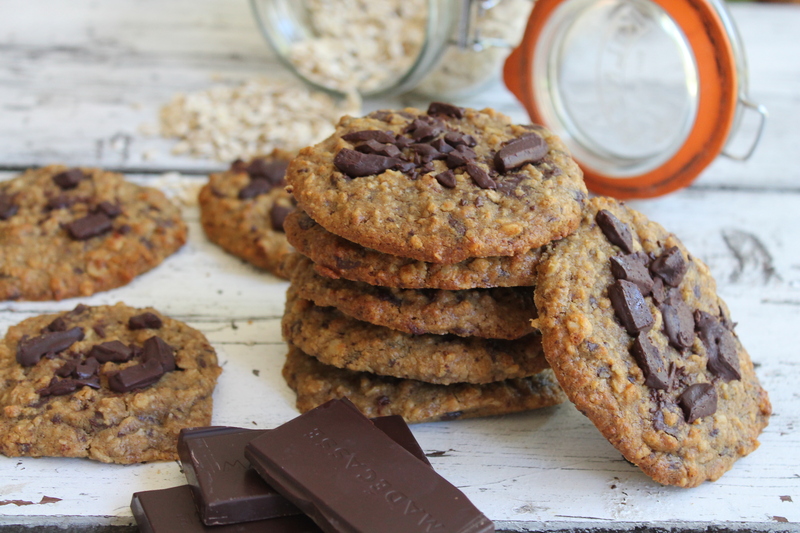 I actually don’t know why I haven’t experiment with it before as they are so easy to make, and they are just the perfect dessert or healthy snack! In this version I have decided to use one of my favourite fruit, apple. Although apples might sound a bit boring to you, they are actually a powerhouse of goodness! They are rich in antioxidants and fibres. The phytonutrients and antioxidants in apples may help reduce the risk of developing cancer, hypertension, diabetes, and even heart disease! I love the combination of sweet and soft apples with the crunchy textured of the nuts and seeds and the silkiness of the coconut yogurt, is literally a match made in heaven! Start by making the chia seeds pudding. I personally prefer to make this the night before and let it thicken up in the fridge overnight. If you didn’t have the chance you can leave it sit in the fridge for at least an hour or so. In a mixing bowl combine the chia seeds with the almond milk and the vanilla essence. Whisk everything well together to avoid any clumps. Cover with cling film and place it in the fridge. After about ½ an hour take out of the fridge and give it another stir. To make the apple compote: chopped the apple in bite size pieces and place them in a pan with the cinnamon, turmeric and a splash of water. Cover with a lid and cook gently for about 15-20 minutes until the apples are all soft and squishy. Transfer it into a blender and blend it until smooth. I didn’t add any sweetener as I think the apples are sweet enough but feel free to add a tablespoon or 2 of maple syrup or honey. To make the apple crisp: chopped the apples in small pieces. Chopped roughly the pecans. Add 1 teaspoon of coconut oil to a pan and let it heat up. Add the chopped apples, nuts and seeds to the pan and cook for about 5 minutes. Add all the spices, goji berries and the coconut sugar (if using). Cook for a further 5-7 minutes until the apples start to soften and the nuts and seeds are crispy. To assemble: place about 2-3 tablespoon at the bottom of the glass, top with the apple compote, then proceed with a layer of coconut yogurt. Top the parfait with the apple and seeds crisp. 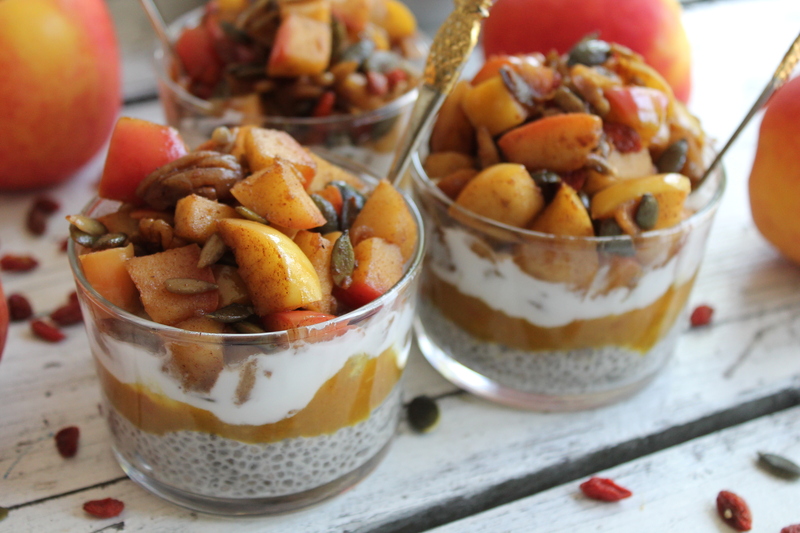 I love having mine while the topping is still warm as I love the contrast with the cold chia pudding and coconut yogurt, but cold is delicious too! Cover the pot with cling film and store in the fridge up to 5 days.